My husband loves banana bread. He has recently taken to making it himself to have at home (aka the ‘Lovell Cafe’) with his flat white. The kids help making the coffee. Cohen is Barista Boy and Jemima is Grinder Girl and they are probably better at working a coffee machine than me! Cohen always gets to eat a bite of Daddy’s banana bread but Jemima misses out (very graciously I might add) because it has egg and dairy in it. 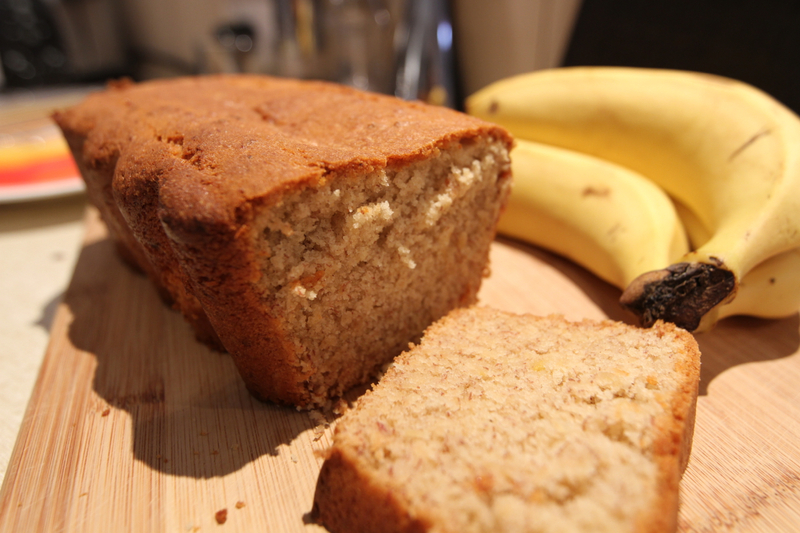 The other week she finally asked for her own banana bread and as Daddy was on holidays, a new recipe was created. Here it is. We haven’t tried it with gluten free flour but it might be worth a go with a little extra water. Preheat oven to 175 degress Celsius. Prepare your loaf tin (we have a silicone one so no prep required and no butter contamination from greasing another cake!). Cream Nuttelex and sugar until smooth. Add in the No Egg mixture and then the bananas. Add flour and spices and stir until just combined. Pour mixture into loaf tin and bake for about an hour (or until knife comes out clean – my oven is terribly slow). Let cool a little and then remove from loaf tin and leave to cool. We slice the bread and freeze what we don’t eat straight away. Then we have some whenever it’s banana bread time. Tip: you may need to add extra water if you feel the mixture is too dry. You don’t want the mixture too sloppy though – it is a ‘bread’ not a cake. well, I know what will be for weekend morning tea at our house 🙂 Looks yum … and a lot easier than others I’ve seen too!